I guess to depends on the person's thoughts in what they believe. A jealous person has jealous thoughts, a proud person has proud thoughts and a skeptic has cynical thoughts. A cynic most of the time puts the onus on the other. There are two things that come easy and that is to blame or to critize there is not much onus on either. Why are you on this forum? Do you think you will convert people to atheism? Is this your goal? Are you trying to "enlighten us"? Time will come when humans will be insane and if they see a sane man, they will go up against him and say he is crazy. The reason is that he is different from them. Insane meaning extremely foolish not mentally impaired. Our goal is our salvation of which we have a resurrected Christ in which He sets us an example. To love Him is to be close to Him and to do that we simply get rid of sin. Sin is seperation. I know you think emotions come from the brain CopticApostate, but we must differ on how we use these emotions. We have a seperate framework which bears the truth and life of Christ and if you believe we are extemely foolish, then we must part ways. This is a wonderful and extremely important topic for any Christian. It seems even more so in this group as it seems we have a couple of skeptics among us. We don't pray because God needs something from us. Even though God is active in our lives, we don't pray so we can persuade him to change his plan. We especially don't pray so we can test God or prove/disprove his existence which is why you never will be able to measure the results of prayer. We pray so we can grow closer to God. In many ways it doesn't matter exactly what you pray for and/or what words you use. Jesus himself taught us to pray that God's will be done on earth as in heaven and yet he also taught us to pray for our needs (daily bread). He taught us to pray for forgiveness and protection from evil. In orthodox practice we use many tools to pray where we don't use our own words and/or imagination. Many of us use some form of the Jesus Prayer "Lord Jesus Christ, Son of God, have mercy on me a sinner." We pray in chant (elhan) and in recitation of psalms, etc. It's also interesting to note that (from our perspective) chant/elhan is not singing even though it may seem like it on the surface because of rising and falling tones. Reciting the Jesus prayer and/or repeating or chanting kyrie eleison is not meditation even though, to an onlooker, it may look and sound similar to a Buddhist chanting. I remember hearing a story about a man who visited a monastery on a retreat. (well, I mostly remember it. =P I may get some details mixed up. I think this is a known story if anyone would like to correct me.) One night, after the evening prayers one of the monks approached him and remarked what a wonderful prayer this man had and that he was definitely in God's presence. The man thought this was strange because he was quite sure the monk couldn't see him while he was praying and he wasn't even praying out loud. How could the monk know that his prayer had any sincerity at all let alone claiming that he was in God's presence? The explanation was that the monk could see the change in this man's face. Prayer isn't about using words to get God to change the world. Prayer is about turning to God so he can change us. I'll keep this brief as it's been made clear to me, over and over, that I'm not welcome here. I'm not here to "enlighten" anybody, Another deconvert and myself have engaged in eloquent discussions here before and have been swiftly shut down. I will refrain from doing that again. If I am to engage in such discussions there are other more receptive places and I was able to have proper dialogue that didn't turn into blatant accusations. I'm simply stating fragments of my mind here. You should probably ask yourself why mere thought fragments would have you so jumpy, @Amoussa01. And, my dear Josh, I've never made any claims that anyone was foolish in this thread. By what calibre do you even measure "sanity"? What may seem sane to you might be insanity for another and vice versa. I do not care how anyone measures sanity, however, when ideals are imposed on people and possible harm of any kind may be inflicted, this is when I step up to call people out. It's not like any religion on this planet has a track record of being harmless in any way - Christianity included. And though there seems to be an overlap, sceptics aren't always cynical. Sceptics are just knowledge-seekers. It doesn't take any degree of cynicism to ask someone to back up their initial statements. I could very well make the claim that I hunted down, killed and devoured all of the Greek deities and that's why their presence is nonexistent now. Logically, you would ask me for evidence, but how would you feel if I threw around labels at you in response? And @George27, I get the impression that you're not addressing me but the members of this forum. However, since you included sceptics and by default, me, then my comments weren't taking a jab at "unanswered prayers". Ironically, I was taught that prayers were never to be used for material requests, but rather to form a connection with god. That "connection" is also known as a "dopamine rush" that comes with meditation, you feel enlightened like you've somehow ascended to the heavens or something. Despite what it seems, I used to pray too you know, so this isn't just some bitter atheist jibber-jabber. As with almost everything that induces a dopamine rush, you build up a tolerance if you don't receive a higher level of stimulation and that's where the feeling of "god's not there anymore" come from with decades of prayers. That's why people spice it up with alhans and taraneem but to me, it just seems like you're frying your synapses. @CopticApostate, I encourage your presence here and welcome your skeptism. Your spirit is not one of defiance but I notice you are sharing your opinion with respect. Please continue to do so. The only blatant accusations I see are your blasphemies my friend. You say you're not here to enlighten anyone, so what is it that you are doing? To have nice discussions on why God is not real? How prayer is just a result of chemicals and neurons firing in the brain? It is one thing to come, ask, and inquire; it is another thing to come and stir people away from the Truth. You are not coming here looking to engage in fruitful discussion to ask and learn more about the faith and why you should believe or how one can have faith--you are coming here to spread poison. It is quite a wonder how the moderators have allowed you keep going. By the way guys, I get a dopamine rush when I am with my family....so obviously they do not exist. I think I understand skepticism pretty well. For whatever reason, God made this universe in such a way that reaching for him requires faith. God gave us reason and senses, which are tremendously useful faculties for us humans, and yet for some reason spends most of our time a little out of reach of these faculties. This very naturally gives rise to many types and levels of belief and skepticism. I don't fully know why He made the universe this way, but I have to think that it's all part of the plan. While I'm not a Pluralist in the proper sense, I do think that pluralism is a great tool for people of different faiths to have meaningful conversation. If a Theist and an Atheist would like to have a meaningful conversation about the existence of God they both need to meet in a logical space in which there may or may not be a god; if either party takes the stance that the opposite view is insane of offensive, they're not going to get very far. I don't support anyone who attacks you or tries to push you away from a religious discussion. I actually think a little bit of skepticism is healthy. It makes us think about our beliefs. For my part, right now, I think this is a good topic for me to think about. Specifically on the topic of chanting; I'm working to understand, in a "noetic" (cognitive) way, this idea that chanting is not singing. In my gut I feel like I get the idea, I don't only believe the idea because it's what I was told, but I also feel I can and should understand the idea more cognitively. I've contemplated this a number of ways. The side of me that likes music and singing finds it unfair to say that chanting isn't singing because singing is a real expression of a wide variety of feelings. Why can't song express love for God as well as other emotions? On the other hand, the part of me that prays sees the distinction. It's almost like a two way mirror; looking from one side there is a barrier, but from the other side it's just transparent glass. I've thought about this same idea about the barrier between theology and philosophy. Theology is not philosophy to the theologian even though the philosopher in me doesn't quite like that idea. To a Christian, reading Scripture is not like reading other books even though the side of me that appreciates secular education sees the Bible as an important historic book. Likewise, to a Theist, a connection with God is not a "dopamine rush" nor is it any other internal chemical reaction even though the part of me that likes scientific explanations appreciates these explanations as much as you do. Maybe this too is a barrier that only exists from one side, but it is real to me and to most people here. @CopticApostate, I have a suggestion/request. Just as it is wrong for others to tell you what to believe and/or to judge you for what you believe, please try to give me a little credit for what I do know, sympathy for what I don't know, and where we simply differ in opinion I ask for some pluralism. I get that your equation of "connection" with "dopamine rush" comes from a scientific contemplation of what you observe; I get that it's sincere and not malicious. I'm asking you to consider and recognize this from a point of view you may not have considered before. My father of confession speaks of the idea of "fallacy of enthusiasm". He points out that one of the things the devil does to make us lose our path is to pump us up with enthusiasm. If our father of confession prescribes fasting until 10am because that is our current level of ability, excessive enthusiasm may cause us to say, "oh yeah, I can do better... I'll fast until 2pm". Ironically, this is a form of indulgence and is counter to fasting. Similarly, if prayer causes a rush of dopamine, I fear that you may be falling to this so called "fallacy of enthusiasm" my father of confession is talking about; this eventually leads to a fall. I think the same thing in regard to anyone who means to "spice up" their prayer with elhan and taraneem. Don't get me wrong, some elhan can be a lot of fun, It's been a long time since I've been to a Coptic Church and still the month before Christmas I often get لعليقة stuck in my head, it feels rather good and I'm sure dopamine is a part of the explanation. It's just that I'm also saying that if the fun consistently gets in the way of prayer, we are at minimum doing it wrong and at worst (as you said) frying our synapses. > "You say you're not here to enlighten anyone, so what is it that you are doing? To have nice discussions on why God is not real?" > "How prayer is just a result of chemicals and neurons firing in the brain?" > "You are not coming here looking to engage in fruitful discussion to ask and learn more about the faith and why you should believe or how one can have faith--you are coming here to spread poison." That's your opinion. Inverting the idiom - "One man's poison is another man's meat" after all. > "It is quite a wonder how the moderators have allowed you keep going." They're welcome to shut me down if they wish - and they have all the right to. I couldn't care less though, I will not change my views and my online presence won't be affected. > "By the way guys, I get a dopamine rush when I am with my family....so obviously they do not exist." False analogy. I haven't made that claim here. The dopamine rush can come from numerous things and it's essential for our sanity and survival. Even the air we breathe can be one of them. Prayer/meditation just happens to be one of those things and you have to take it for what it is instead of making the claim that it connects you to someone you can't see because of the feelings it produces. Otherwise, you're going to have to explain why Muslims feel the same "connection" or why Buddhists and Taoists feel the sense of "elightenment". Thanks for the detailed response. Those are the kind of comments I like to read here, civil, detailed and on point. The phrase "Rome wasn't built in a day" comes to mind. The usual meaning would be along the lines of big achievements starting from very small steps. I can subvert it here, if you're too overenthusiastic, you're bound to crash at some point. I reckon that's what your father of confession was getting at. If prayer was like a drug (I mean it in the pharmaceutical sense where "drugs are medicine but it's the dose decides the poison") then it's probably a case where he didn't want you to "overdose" and then decide, "Nope. This ain't workin' for me." I don't really understand your request though, I was on the other side so I can look at it with both perspectives. I've simply decided to go with the one that's more credible and not based on believing based on feelings but rather, based on logic and proof. To respond to your first paragraph, I think our brains simply evolved over millions of years to be capable of complex cognitive functions (*snort* If I were to be condescending I would say that I know a few people in my personal life whom this probably would not apply to lol, but I digress.) Even other animals display similar intellect to a lesser degree. Parrots are capable of learning speech and mimicking actions (I've seen an African Grey parrot who would mimic its Muslim owners at their usual prayer times - bobbing its head and chanting "Allah" and all that). Crows are nimble with tools and very good at human facial recognition and chimps have been observed to "worship" rocks similar to primitive humans. Give them all a few million years of development and I doubt that humans would be so conceited and vein as to think they are above the animal kingdom and that their cognitive processes are a gift from a divine being. Another thing with chanting. It could just be me being my usual nit-picky and petty self (trust me, it's more irritating for me than for those around me. OCD is horrible.) The difference between music and speech is the length of notes (in other words, stretching of the spoken words) and the tempo (the speed of the stretched spoken words) - rhyming being an optional add-on. Lengthy notes at high or low tempos are generally considered "music" while short notes at high or low tempos are considered speech (unless of course, you're trying to talk in slow motion) but the addition of instrumentals almost always signifies that it's "music". As such, your chanting and alhan are still music as they have many of the characteristics (lengthy notes, instrumentals, rhymes, etc). The reason I bring up tempos is that many people prefer a certain range of tempo, I'll like higher tempos so rock and heavy metal are kinda my thing. And that's why I find no "fun" in alhan. Matter of fact, they've always been more effective than lullabies to me. I can say the same for jazz and slow blues music. > " I think the same thing in regard to anyone who means to "spice up" their prayer with elhan and taraneem." Incidentally, this is what the Coptic church does with its 3-hour liturgy every Sunday. All of that is non-biblical as Jesus himself said to just say the lord's prayer. Yet, you have clergy doing just that and Coptic parents forcing their kids to go to church every Sunday. It is very clear now that you are not here learn but to "enlighten us", right? You are the "all wise, all knowing, learned man" here right? and we are the "ignorant fools" following some make-believe God, right? I find it so sad how little you know about your faith and its practice. I recommend learning more and asking questions, not for the sake of attacking someone's faith, but to truly understand and learn about it (even if you do not necessarily agree). There are athiests who are respectful...you should learn from them. Firstry, I qualified insane or crazy as extemely foolish. That was the context of the message. I found something in a book on our faith to answer the question of why doesn't God answer prayers. Repentance is necessary - 2 Chronicles 7 -14. "If My people, who are called by My name, will humble themselves and pray and see My face and turn from their wicked ways, then will I hear from heaven and forgive their sin and heal their land". Sin keeps prayers from getting answered. Righteous is necessary. James 5:16. "The prayer of a righteous man is powerful and effective". The example of Elijah is given who prayed it wouldn't rain and it didn't for three years and prayed for rain again and it did. Righteous refers to a daily, steady walk with the Lord. We try not to let anything come between us and Him. Forgiveness is necessary. Jesus said that when we pray, if we hold anything against anyone, we are to forgive that person, then God can forgive our trespasses (Mark 11:25). Obedience is necessary. 1 John 3:22 And we receive from Him anything we ask, because we obey His commands and do what pleases Him". Obedience is the trademark of a righteous man. Sincerity is necessary. Jeremiah 29:13. "You will seek Me and find Me when you seek Me with all your heart". Agreement is helpful. Jesus said, "Again, I tell youthat if two of you on earth agree about anything you ask for, it will be done for you by My Father in heaven. Persistence is helpful. Ephesians 6:18 "And pray in the Spirit on all occasions will all kinds of prayersand requests". Faith is necessary. Hebrews 11:6. And without faith it is impossible to please God". Because anyone who comes to Him must believe that He exists and that He rewards those who earnestly seek Him. Once again, thank you. Even if we don't end up agreeing, this is a very imortant and healthy topic for me (and I imagine any christian) to look at from every angle possible. If you look closely, you'll see that Orthodox practice is absolutely packed solid with tools that are designed to keep human passions under control while still keeping the mind fully engaged. I by no means consider myself an authority on the subject, but I have struggled with this enough to be familiar with a fair share of what orthodoxy offers. First of all, personal prayer, though important, doesn't really take center stage in our faith. We rely heavily on things like the Agpeya in our individual prayers and we follow a well structured liturgy every Sunday. I think your average protestant would criticize us for having prayers that are overly scripted. Our argument (as I understand it) is that it is extraordinarily difficult for any person without a lot of guidance to really be "spirit filled" without human emotions taking over. (I know this will be a point of disagreement between us, but I firmly contest that there really is a difference between "spirit filled" and chemical human emotions.) When we say our own little simple prayers in between our reading and recitation of the fathers, we are reasonably guarded from becoming overly passionate about our individual concerns and more prepared to ask God for his will and not ours. Another thing is the regularity of orthodox prayer. To an orthodox person, prayer is supposed to be as natural as breathing. This is much easier said than done, but if we manage to do it right there really is no trigger for a dopamine rush. First, you are not entirely incorrect in your assessment. The safeguards against dopamine in our practice means there is a well recognized struggle. In any spiritual struggle you are going to encounter people at every possible level of success in their fight. Namely, you are going to find people who hardly seem like they are fighting at all. Second, you are not entirely correct in your assessment. When you see someone spending a lot of time in church, they may be there with a conscious intention of keeping their human passions under control. I say this from personal experience. I know what it feels like to fall to excessive enthusiasm; I was there the first time I chanted a psalm in coptic for Holy Week (that was a pretty rad feeling, chock full of dopamine) I also know how much I had to practice before I could chant the psalm in a reasonably properly prayerful way without the excessive enthusiasm. The third thing this means in my opinion is that you should not be surprised if and when people on this forum sound defensive. Some of us are working very hard to live a spiritual life in spite of our human weakness. It won't be a big deal for someone who really has their passions under control, but for those of us who are struggling, throwing our faults in our faces as though we aren't trying comes off as pretty mean. You guys should save yourselves the time and effort in responding...none of this will amount to anything until humility and decency are learned. In the meantime, go and pray for this guy and hope that God can reach him. This is just such a tricky and essential topic. I feel a lot of sympathy for anyone who has trouble with prayer because I've been there too... In some ways I still am there. It's especially troubling when someone thinks God isn't listening or doesn't care. Sometimes part of how God answers prayers is through people. @CopticApostate You continue to rely on concepts of psychology to "rationally" explain away prayer and how it is evolved, you need to realize that even the intelligent men who experimented and proposed these concepts believe that there are many uncertainties and fallacies within them. 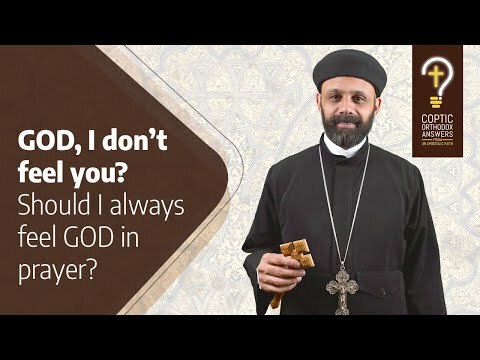 @CopticApostate Take a look at Father Lazarus on youtube, might clear up some misconceptions for you. I listened to something really good this morning. The story is not perfectly on the point of the forum, but it does make a really good point. There was an elderly man, not quite used to using his new telephone, who got a call one day. The phone rang. He fumbled a little with the the receiver not sure where to speak as his old phone had a horn on the wall to speak into, this phone was a small box on his desk with a circle of numbers. He clumsily sort of shouted at the numbers on the box, "Umm. Hello. Hello. How do you use this infernal thing?! Hello. This is George! G-E-O-R-G-E! Hello? Who's Speaking?". The person on the other end finally had a moment to get two words in said, "You're speaking!". The old man responded, "Oh I thought the voice sounded familiar. Thank you." and hung up. The old man in this story behaves in a very silly way, but he also behaves exactly the way most of us do in prayer. We do our best to pray, but we don't really know how prayer works. (More on point here) We talk, and talk, and chant, and read, and notice that Paul has a hole in his sock, and chant some more. We never quiet our mind enough to hear God's voice, and then wonder why we he doesn't answer. Sometimes all we have to do for God to answer our prayers is let him. I would also like to add that the soul or the nature of our being transcends after death. CopticApostate you might not understand the soul as we understand it and that this ability to transcend away from evil (because we are fallen) is worthy to strive for. Case in point, Stalin was to become a preist in the Russian Orthodox Church but instead he became embroiled in politics and ended up ordering the death of tens of millions. So the very nature of our being needs to transcend above this as we are all fallen and all have the potential for evil. The church deals with this in guidance and prayer. As for indoctrination, when should we have the knowledge to do good and have the abilities to use our minds and hearts to do good? Evil does exist and can athiests combat it? Even if you were born into our Christian faith your feel will allowed you to leave but the consequences of leaving with resentment is a sin you did not deal with, for resentment is the inability to deal with tribulations. We pray so we can deal better with life and transcend to a wisdom beyond our comprehension.